Last Updated Mar 13, 2019. Just like with everything else, every baby reacts differently to developmental leaps. Additionally, some babies will sail through certain leaps without batting an eye, only to be harshly affected by the subsequent leap. While the bad news may be that developmental leaps often do disrupt sleep, the good news is that when handled correctly, the sleep issues that arrive along with the leaps need not be permanent. Travel often disrupts sleep for two reasons. Either the parent chooses to leave behind routines and schedules in favor of a more relaxed vacation, or the parent is forced to tend to their baby in ways and at times they normally would not while at home. Regardless of what transpires on vacation, babies often come home jet lagged and accustomed to a new, more parental-hands on set of sleep associations. *If you are driving four hours or less to your destination, try to leave after your child’s second nap, or after their first nap if they’re down to a single nap per day. That way when you arrive your child can go down for bedtime shortly thereafter. *If you are driving five to nine hours, leave at, or shortly before bedtime. Once you’ve gotten to your destination, simply keep the child up for about 15-30 minutes, then redo their bedtime routine and put them down for the remainder of the night. *If you are driving ten hours or more, I would suggest driving during the day starting at whatever time is most convenient. Most babies will not sleep soundly all night in their car seats and driving through the night increases the likelihood that the driver will have an accident. *If you are staying in a hotel, be sure to ask for a handicap-accessible room. These often have spacious bathrooms that can accommodate a crib or Pack n’ Play. *If you are traveling with an infant who is not yet standing and they will be sleeping in a Pack n’ Play, consider purchasing a SnoozeShade, or if they are standing, consider the Slumberpod, and don’t forget a portable white noise machine. *If at all possible, give your child at least 15-20 minutes to work though any night wakings they may have (assuming they are sleeping through the night prior to you having left on your trip) before tending to them. *If at all possible, honor your child’s need to nap in the hotel room/bedroom you’re staying, especially for their very first nap of the day. If you think about it, illness often (but not always) tends to disrupt sleep for one main reason: the parent reverts to helping the child fall back to sleep. I cannot tell you how.many.times I get emails from clients whose babies had been sleeping through the night perfectly until they get a cold/cough/teething. In an effort to calm and comfort the child, the parent soothes them with feeding, rocking, or co-sleeping. The illness resolves itself, but many times the new sleep associations linger. Regardless of if new, undesirable sleep associations remain after the illness has passed, just having an illness that wakes the child at night is enough to keep her waking for days or weeks once she is no longer sick. Get back on track with sleep training! So, how do we deal with all these issues? Developmental leaps – My best piece of advice is not to change anything from what you are currently doing. If you have a fully nap and night trained baby/child and you notice their sleep is disrupted due to a regression (leap or other reason) continue to move forward. If you do not normally help your child to sleep, do not start to do so now. If you need to shorten their nap times or put them down earlier to compensate for poor naps go ahead and do so. But, do not revert to helping them fall asleep simply because they are struggling to sleep during the regression/leap. Simply set the schedule and keep them on it, and wait out the end of the regression/leap. They usually last anywhere between 4 and 14 days. If your child is not yet sleep trained, these leaps will often cause a mildly problematic sleep situation to worsen drastically. In this case, I would again suggest trying to continue on with the status quo. Almost certainly parents of non-sleep trained children will choose to use more involved methods to help their child fall back to sleep or work through the regressions. I simply ask those parents to be extremely watchful of when the regression/leap has passed and to try to immediately scale back the extra help they were giving the child once the regression is over. Travel – Besides following the “If” tips above, I would suggest trying to get your child on the local time zone as quickly as possible. This goes for when you’re on the trip and for when you arrive back home. The easiest way to get the child back on the local time zone is to make sure they actually wake up and start the day around 6:00 or 7:00 am local time. Once you arrive back home and you find that you’ve fallen into some sleep associations you’d like to break, I suggest giving your child one full day for every two hours they were off per time zone before addressing sleep. So, if they were off by five hours, you should give them about three days before starting to work on sleep. Once you get them back on their time zone, immediately start back at square one with whatever sleep training method or plan you used when you originally trained them. Keep in mind that methods that worked quickly on younger children tend to illicit a much stronger response from older children. Be prepared for things to take a full 7-14 days of consistency on your part before things improve. If you did not have a sleep trained child prior to having left on your trip and find yourself in a more difficult sleep situation once you return from your travels, then it is as good a time as any to buckle down and do some sleep training. Feel free to use any method you wish, but do something to address the sleep issues as they are unlikely to fix themselves (for the long term) on their own. Illness – I always tell my clients, if your child is ill, tend to them! Administer Tylenol or another age-appropriate, pain-relieving drug. Give them fluids if necessary, but avoid the breast at all costs. Instead, give them liquids via a bottle or sippy with a light on, change them if they’ve soiled themselves. The only thing to avoid is helping them fall back to sleep. In other words, once you’ve addressed whatever it is that was wrong, put the child back down awake. If they are feeling ill and you administer pain-relieving medicine, make sure to sit with them until the medicine has kicked in. Love them, cuddle them, treat them, but once it is time for them to go back to sleep, they do so on their own. Once again, this is assuming your child already knows how to put themselves to sleep. If they do not know how to fall asleep on their own, wait until their illness has finished before tackling that issue. Like travel, you may find that illness exacerbates a moderate problem into a full blown sleep-crisis. Once the child has been illness free for two full days (literally two, full day-time days), check on them if they wake at night, but if they are healthy and safe, leave them immediately. On subsequent nights if wakings persist, consider whether it is necessary for you to enter the room at all. Watching them via video monitor may be all that’s needed to make sure they fall back to sleep without your help. I often like to sleep with my children when they’re sick, especially if there is a high fever present. If this is the case for you, I’d suggest moving in a mattress or sleeping bag into the child’s room. Put them down awake and let them fall asleep on their own. Once they’re totally asleep, enter the room and sleep on the floor next to them. You should definitely monitor your children while they’re ill if you so choose to do, but you want them to fall asleep on their own before you make your way into their room. Finally, I lump teething into the illness category. Teething almost never disrupts sleep, but if you find that it is, simply treat the child with a pain-reliever if you choose to do so, stay with the child until the medicine has kicked in, then put them back down awake. Sleep regressions mainly occur for 3 different reasons: developmental leaps, travel, or illness. If the regression is a developmental leap, stay the course! You can put baby down for naps and bedtime a little earlier or later, but riding it out by being consistent is the best course of action. If the regression is due to travel, give your baby a couple days once you get back home (based on the time zone changes) to readjust, and then either scale back your assistance, or re-sleep train. If the regression is due to sickness, once baby is 100% well for 48-hours, re-sleep train. If they are not sleep trained, consider sleep training! The best way to avoid non-developmental regressions is to *not assist your child to sleep* in the first place. 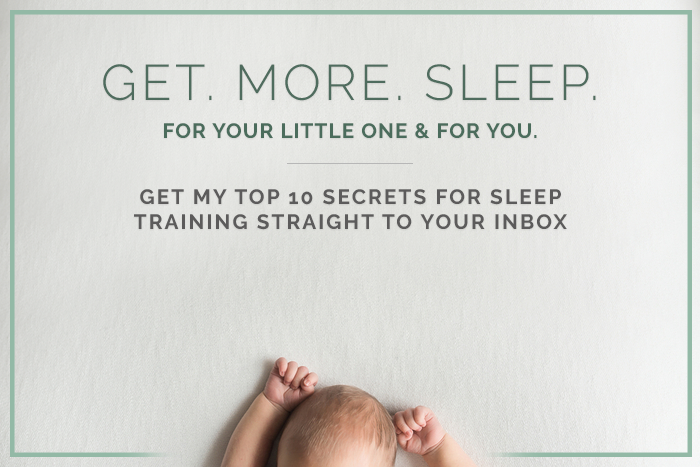 If you’d like to learn more all of the factors affecting your baby’s sleep like the proper room environment or age-appropriate schedule – sign up for my newsletter! Some sleep professionals do advocate preparing for a move to a new time zone by gradually moving the child in the new time zone’s direction for a week or so before their trip. I find that it’s extremely complicated to do that, and, children are so highly regulated by the sun that your efforts are often wasted. I’d suggest simply allowing him to get on the new time zone when he gets there. Thank you so much for your blog Natalie! I’m trying to figure out if my DS is experiencing a regression or if he just isn’t fully sleep trained, or probably both. He is almost 7 mo and this is our second go-around with CIO. He had one rough week and then about 4 days of crying less than 30 min and sttn (8-4:30ish) and is now on week two of screaming/crying for over an hour and then waking less than an hour after to start crying again. He sleeps in two – hour intervals (like he did as a newborn). I think he’s anxious about bedtime bc crying starts with bath time now (when his bedtime routine starts). My question: how many days of cio before I conclude it’s not working? You’re very welcome. Kiddos can definitely sense when bedtime is coming, and any inconsistency on the parent’s part of following through with whatever their plan/method was can cause more anxiety. In regards to your personal situation, it’s hard for me to answer without know more specific details. As a general rule, I would give whatever method you’re doing a solid 14-16 days of extreme consistency before you start to tweak things. 14-16 weeks?? Wow. I thought it was days. Okay. Onwards we go. Thanks Natalie. You’re right. 14-16 DAYS, not weeks. Please forgive me. I talk about weeks so much in terms of children and their ages, I’m sorry. If you are using a cradle or bassinet to start with you will need special sheets to fit these. You can get away with just 2 sets as babies are only in them for a short time (6-10weeks) and if you run into trouble you can always use a bunny rug! Thank you for your insight, it does explain a lot. However, I still need help. We just got back from the east coast with one time zone and two hours difference for two weeks, during that time i tried to keep my baby as close as our home local time, and i thought it worked. I knew i was going to have a hard time coming back home but nothing like this. She is 5 1/2 months, before we went on leave, she was sleeping from 7-7:30pm to 2:30am wake up for feeding, then up at around 5:30-6:00am for feeding and back to bed until 7-7:30am. We haven’t sleep train her yet, we tried when she was 3 1/2 months, but didn’t work. So we were going to start now. But since we got home last Sunday night, she has been going to be at 7:15pm, eats her 2oz, wakes up at 11:30pm eats 4oz, back to bed, then up at 2:30am eats again and the up every hour from that time on. Last night she woke up at 3:30, 4:30 and didn’t go back to bed until 6am, by then my husband and I had to get ready for work. I don’t want to start sleep training if she hasn’t get used to the new time zone. Any suggestions? her bedtime routine is strict, starts at 7pm, bath, change, lights out, bottle, bed, she usually falls asleep drinking her bottle. She is not a big napper, she takes half hours naps or not at all during the day, and others she takes up to two hours nap once or twice a day. She’s more than adjusted to the local time zone. I think the only thing that will fully take care of this night waking issue is to sleep train her, so I say – go for it!! Make sure to do naps at the same time as night sleep. Good luck!!! you say during illness don’t offer the breast ever? Are you referring to a certain age at when to do that? I dont see that anywhere? My 4 month old had high fever for 6 days and hospitalized for 4 after that. Basically spent a good 10 days sick . He barely would eat and he’s a breastfeed baby, he surely would have been in worse shape if I didn’t feed him for 10 days. It was a struggle to get him to nurse at all given he felt so bad. Luckily he was given an IV at the hospital for hydration. Hi Natalie! I’ve enjoyed your post. Very very useful! I have a follow up question regarding illness. Now she is 7 months and in her bedroom. We are almost finished sleep training night & naps following your book. So now I will work my ninja way in to her room to keep an eye on her.. but what to do if she sees me? She may wake during the night.. Should I leave the room wait for her to cry and fall back to sleep to be able to go back in?! Hi Anais! Thank you for reading! 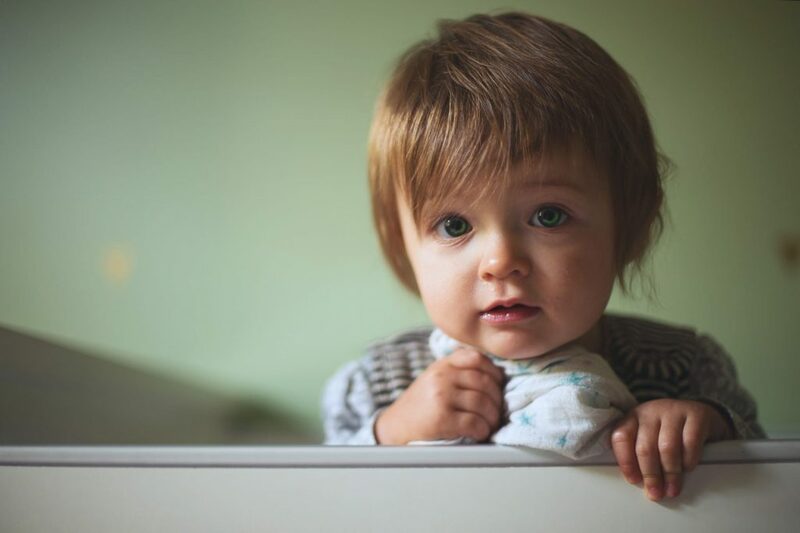 Here’s my blog post on dealing with illness in case you haven’t seen it: https://www.babysleeptrainer.com/how-to-help-your-sick-baby-sleep/. I, too, advocate all families room share (not co-sleep) during illness. It’s up to you if you want to stay in the room and ignore her/do checks, or, if you want to stay out of the room all together until she falls asleep. Just make sure you make it back in the room to sleep near her if you do choose to stay outside the room while baby falls back asleep. Hi Natalie, thanks to you my 9 month son has slept through the night since he was 16 weeks old and I can count on one hand the amount of times he’s woken up in the middle of the night. However, he is all of a sudden so difficult! He has started protesting when I put him in his crib and has started crying again like he did when we first trained him. Could it be separation anxiety? What do you think about introducing a lovey or some sort of transitional object? Or should I not mess with a good thing since he’s been able to sleep all this time in an empty crib? Thanks!! Hi Jolie! That is so great to hear! Thank you for letting me know! What he’s doing is totally normal – it could be a developmental leap or just an off few days. Stay consistent! I don’t think you need to introduce anything new, but rather stick with the program and things should resolve themselves in a few days to a couple weeks! So what do you do if you’ve made the mistake of co-sleeping with a 15 mo while they were sick? We tried to leave her in her own bed/room as much as possible but she shares it with her older sisters and would remove her when she started screaming. She’s now been healthy for 2 weeks, but the bad habit of waking up 1-2x per night persists and she ends up back in our bed for the last few hours. Can’t do it anymore! Please help.